Such a sweet sketch. Great idea of using watercolor pencils to gain confidence of putting water to paper, encouraging and helpful review. Thank you for sharing. As with Neocolor, I like to dip my watercolor pencils in water and draw. You need sturdy paper though. I don’t know why I resist painting over a drawing, but I don’t like to do it. Thanks, Kerfe. Wow, I don’t think I’ve ever tried dipping them in water first. I’ve painted off the tips though. Thanks, I’m glad you found it useful! I don’t think this is the most known pencil out there, but for nature subjects in particular, it’s really wonderful. great share for people who want to see the wide range of colors and how they handle, Laura; and I really LOVE Inktense blocks, or the pencils!! I love these pencils and enjoy using them too. Thank you for reminding me how wonderful they are. Your bird is so soft with the pencils, lovely! Thanks, Cathe, and glad to hear you love them too! I bet you could make them look like a million bucks. They would be wonderful for someone wanting to do landscape work. I’ve actually combined the Inktense and these Graphitints in one painting, and been happy with the results, so I thought it might be nice to show those too. If it weren’t for watercolor pencils, I don’t think I’d have ever been brave enough to try painting! 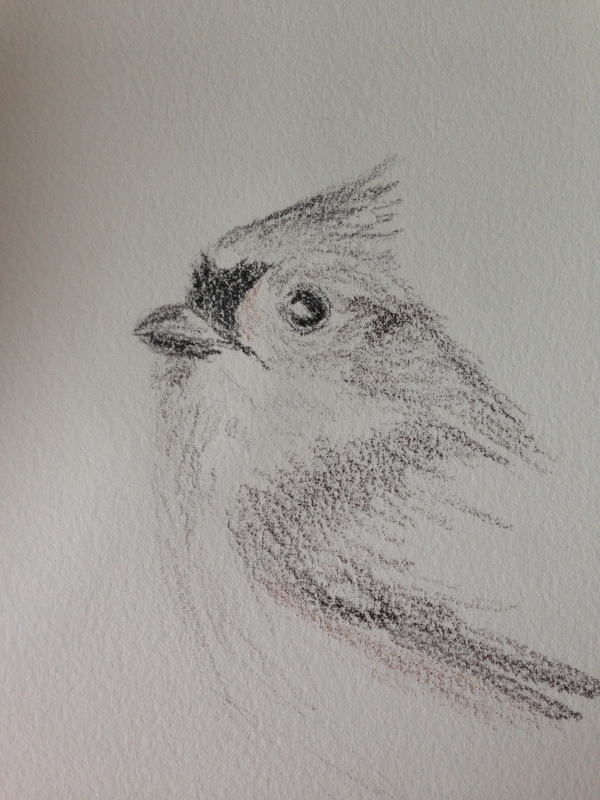 Nice shading on your Titmouse. These are not easy birds to photograph or draw! Thanks for your review post today, Laura. The Derwent products are outstanding. Love your bird! Love your sketch. What a great idea the watercolour pencils. Thanks! They helped me a lot when I got started and I still enjoy them for quick and easy portable work. Glad you enjoyed! Woot! Glad I could help, Rebecca! I just love Derwent products. I bet you can get them more reasonably priced over there? Although I think Blick’s price is really great. Ummm, well I found them for £25.00 largest set, 24 or was it 25 pencils? I bet they are still more over here? Wow, that’d be a shame, since they are made right there! I need to also, working up to it! But watercolor pencils were my starter. 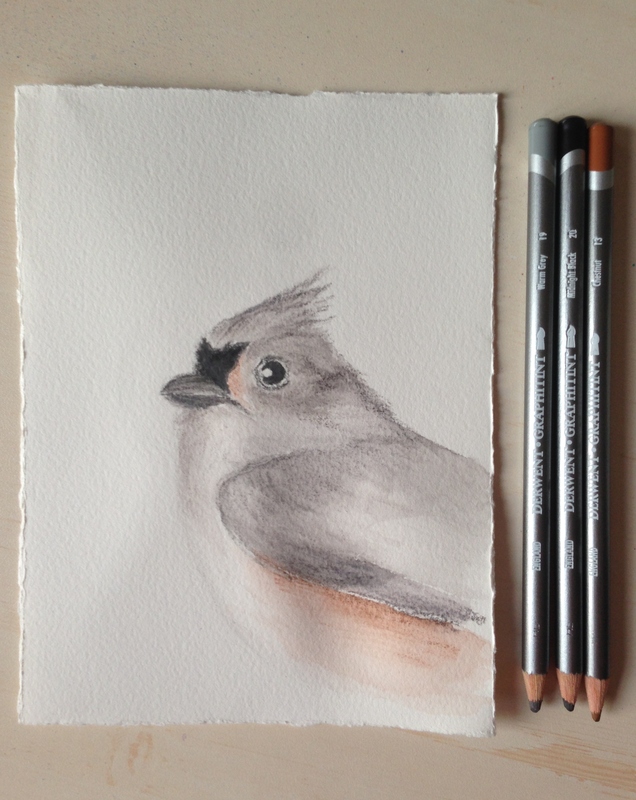 Trying to egg on beginners to join in to World Watercolor Month. It doesn’t have to be expensive or difficult to get started. Have you ever done line and wash, Margaret? a long time ago but I am an aggressive painter who gets insecure with anything less than a bold and juicy “I am here!” approach. To me when I used line and wash it was too insipid…. (for me) oops, I am not judging here. I am a person that uses a red pen to write with because blue or black is not bold enough! maybe it is a psychological thing…..who knows. I can see where it was be a good entry point for you….baby steps in. I am the un-bold babystepper! lol hey, you might go bold and become a stomper! But first I need more skills! lol! Bold should be beautiful! hehe…..we all will catch you! Laura, thanks for the info. I have a set of Derwent watercolor pencils and have used them for light watercolor sketches. They are handy to while outdoors sketching but I find the colors are not very intense. Hi, you’re welcome. I have three sets of Derwent pencils and I think in terms of vibrancy that the Inktense are the most intense, then my Derwent standard wc pencils (which may be the same set you have?) and then these Graphitint pencils are the least intense, with the graphite included. If I have time, I’ll try and come up with an Inktense pencil review tonight and post in the morning. Those colors are amazing! And they dry permanent, which is a big bonus in water soluble media, I think. I’d love to hear about the Inktense pencils….never tries them. I will check them out on line. I like the fact that the colors are permanent. Have a great day. You too! Glad to be able to help! I really like that aspect too. And the colors are really vibrant and bold. I just love Derwent products! Thanks Lucy. I never tried Derwent products but I’ve Staedtler watercolor pencils but Derwent pencils are real tempting! There are so many different kinds out there, but I do love Derwent brand. I’d like to try Faber-Castell’s as well. 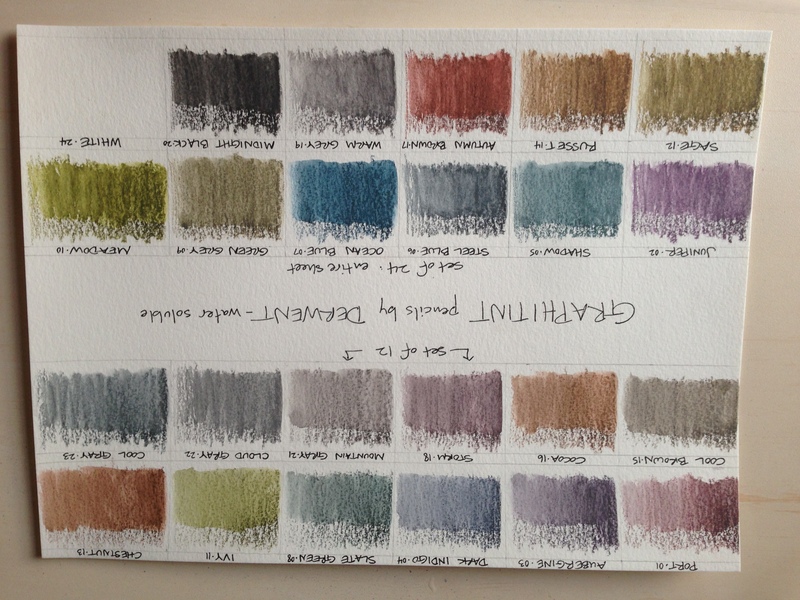 Hoping to show the Derwent Inktense pencils tomorrow. They are my favorite. Mind of WC is great, glad to hear you love him too! Just discovered Peter Sheeler on YT today and really love him also. I haven’t heard of those particular pencils before. They’re less known, but for nature subjects, a real plus I think with the graphite added in. Oh, Jill, please give Jack a big hug for me! ((((((((Jack))))))))) also I’m really curious if his name has anything to do with your name lol? So cute you make a great pair together! Jill are you going to be joining in for WWM next month? Well, that was a few interesting rabbit holes! Loved the video about the pencils. I love my Derwent Inktense pencils. We got the set of 72 colors for the coloring club I hosted at my art center in Wisconsin. They were fabulous and didn’t completely overlap with my set of 24 colors! I may have to get my own set one of these days… I love the idea of World Watercolor month and I think this year I will be mostly a spectator. Your watercolor prompts were really fun in case I get stuck! So many exciting things. Thank you! Lovely bird, Laura!😃💕 I think this is a great post! I tried watercolor pencils and thought the sketcher in me would love them, but I keep going back to my tubes. hehe… I think I might try again in July though! I’m ready to play!! I’ve never tried watercolor pencils yet – DO NOT TEMPT me with MORE art products! LOL! My artinista friend! ❤ BEAUTIFUL BIRD! I love your sketch and the add of the touch of color completes it! Sweet capture, Laura! Thanks so much, Donna! Watercolor pencils are a really fun way to sketch with color and paint without a palette or any mess! They were my introduction to watercolor. Glad you enjoyed it! I love your bird. It looks so soft! Your color chart is amazing! Thanks! Watercolor pencils are wonderful; they got me started in art! I think I’ll head out today and pick up a few.. I do miss the actual feel of creating something on paper, since I’ve been so busy doing art on the computer.. I hope you have fun with them! Oh I can’t wait to try them, I’ll have to let you know how it all works out.. Please do! Have a great day! Amazing!! I’ll have to try this!! Thanks! Let me know how it works out for ya!